Baby’s skin can be so sensitive not just in the first few weeks but as they grow different factors can affect their precious little skin. My 3 year old was 6 days late and she has since suffered from very dry skin that is very irritated and can cause blemishes. We tried many things and prescription products but nothing seemed to keep it at bay. My little boy doesn’t suffer from dry skin on his body but does have slight eczema on his face. Then one day I came across a few photos on Instagram that a few of the mum bloggers I follow had posted showing some baby skincare so I did some research and decided to give Mustela baby products a try, for a very affordable price. Firstly, I will stress it is important that when trying new products on both baby and yourself to do a patch test incase of any irritation or allergic reactions that can come from the ingredients used within the products. MUSTELA CLEANSING MILK // A cream cleanser gentle on even the sensitive of baby skin that can be used both on baby’s face and bottom. This cleanser is designed to hydrate the skin with soothing plant oils and nourishes to protect the hydrolipidic film on the skin. I use this on my son morning and evening as part of our bedtime routine. On the back of my hand I squeeze about a 50p sized amount of product and use a handful of cotton wool to clean his face, his neck and behind his ears then with some warm water I clean over again with cotton wool and pat dry with a clean dry cotton cloth. For my daughter we do the same, apply with cotton wool but we use warm water and wash her face after and pat dry with a towel. MUSTELA HYDA BEBE FACIAL CREAM // After we have cleansed and cleaned the face we then apply the Mustela Hydra Bebe Facial Cream with vitamin E and F as well as shea butter to help keep skin supple and soft. This product again is aiding the protection of the natural barrier within baby’s skin. This light-textured cream absorbs so well and leaves such a lovely light scent on the skin. Both my babies love being pampered daily with these two products. MUSTELA DERMO-CLEANSING // The last product that I purchased from this brand was the Mustela Dermo-Cleansing soap-free wash. This products has shown even better results than the face cleanser and cream. My daughter has suffered with severe dry skin and irrigation on her skin where our water is so hard, that all types of prescription and non prescription products just weren’t cutting it. This product has not only cleared her skin, but it is always soft and supple and no longer itchy. This cleanser leaves her skin feeling smooth, soft and hydrated all day long to the point we no longer need to layer her with thick creams for the dryness and itchiness anymore. We use 1-2 pumps on our wash sponges creating a creamy lather and wash all over and it smells just as nice as the rest of the range. We have loved this range so much that I have already purchased a second lot in the larger bottles and have been recommending them to all my mummy friends. 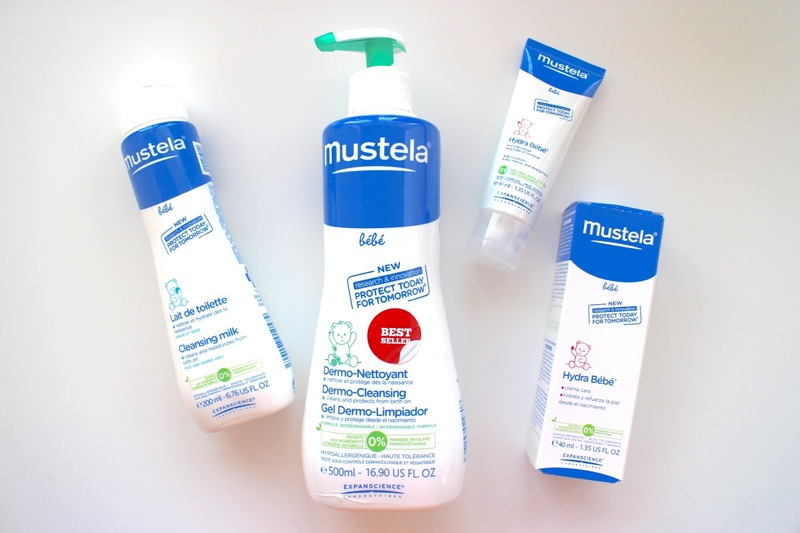 Have you tried Mustela baby skin and body care? What do you do to treat your baby’s dry and irritated skin?